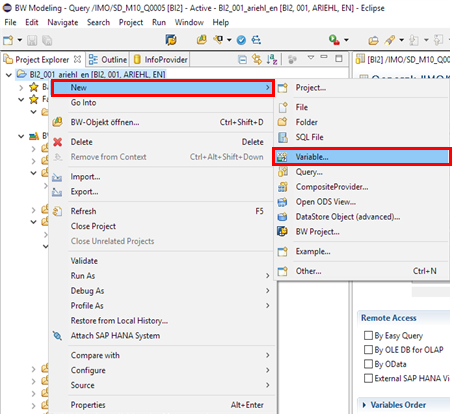 This blog tells you about the differences between SAP BEx Query Designer and the eclipse based BW Query on BW 7.4 and should help you to understand how query design works with the eclipse based BW-Query if you have worked long time with the SAP BEx Query Designer. 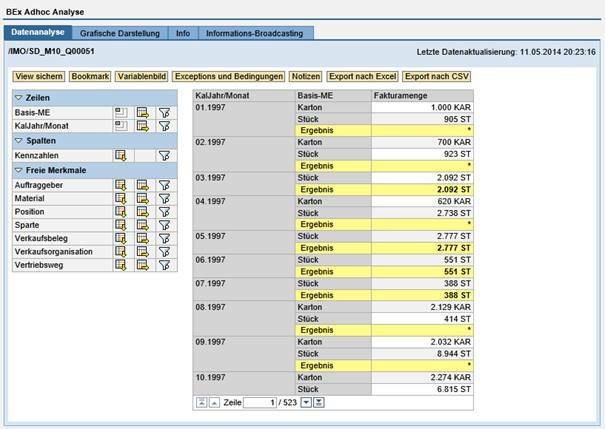 As the SAP BEx Query Designer is a known tool there won’t be screenshots for each topic. 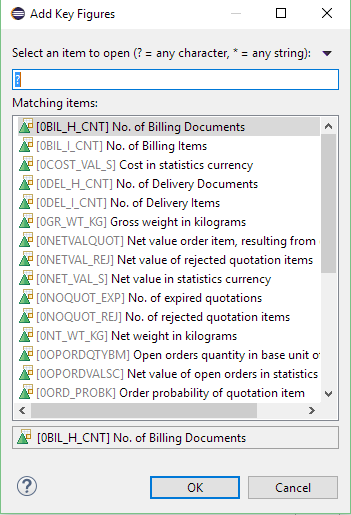 In the BEx Query Designer you have a view which is separated in 3 different parts – at the left side the InfoProvider section with key figures, global structures, global filters and characteristics, in the middle you can switch between Filter tab and Rows/Columns tab and at the right side the Properties pane with its different tabs depending on the object you select. 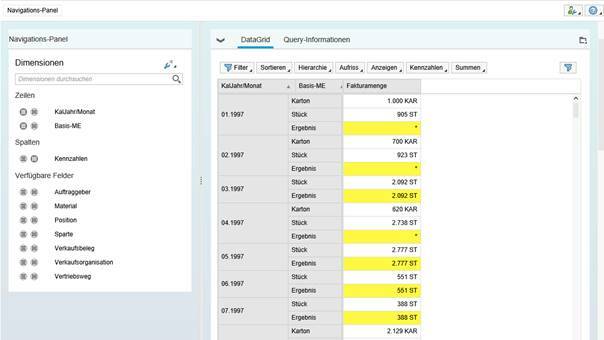 The new query designer based on eclipse has a totally different look and feel than the BEx Query Designer. In the top right corner there is from left to right the preview button, the info provider button where you can switch to the info provider view, the history view with last change information and the delete button. One impression at a first look is that you have a better overview in the old BEx Query Designer. For adding new elements to a structure in the BEx Query Designer you have the possibility to create a new selection or a new formula or you use drag and drop from the info provider section to add the elements to your structure. 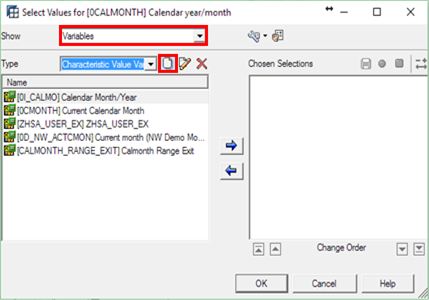 Beside the known functionalities in eclipse there is a third option available, which offers you to add key figures, characteristics or reusable components by right clicking in the rows or columns section and selecting from a popup window. 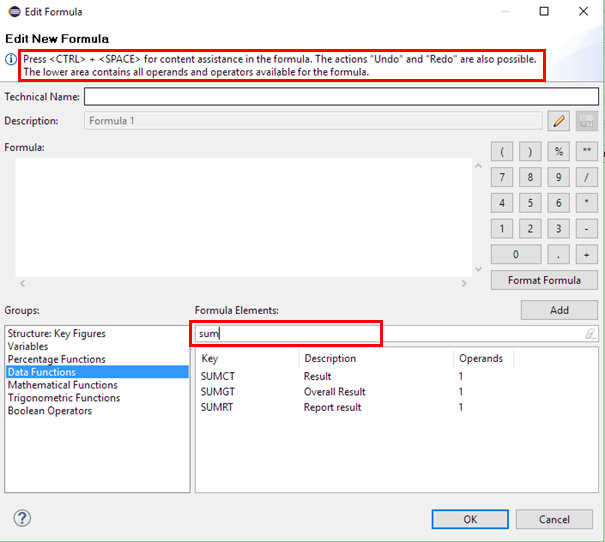 If you want to create a formula in eclipse you can use the content assistance in the formula section for choosing the elements and there is also a filter option for the formula elements but it works only when you filter on content of one topic on the left side. If you want to use for example a sum function you have to select the data functions to see the different options. 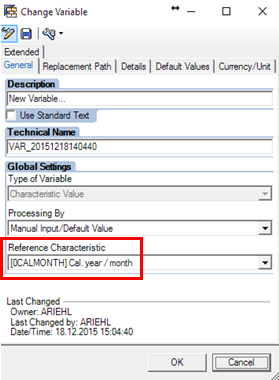 In the BEx Query Designer variables are created by choosing the characteristic the variable should be for in your query. 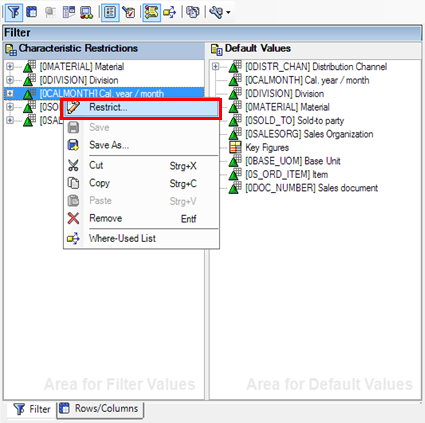 By choosing restrict on clicking on the characteristic in your query on the filter or the rows/columns tab and then selecting variables in the drop down menu, you can select the blank sheet icon and create a new variable. Reference characteristic is automatically the one you’ve chosen. 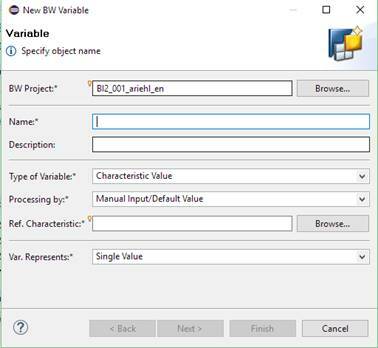 For creating a new variable in eclipse BW Modeling you need to go in your project explorer, right click and then select New à Variable…. Then a new window opens where you need to select the variable settings. Compared with the BEx Query Designer variable creation you also need to fill the reference characteristic. For the creation of new calculated or restricted key figures you have to go to the InfoProvider section and click on Key Figures and then select New Restricted Key Figure or New Calculated Key Figure. Global structures and global filters are created the same way. You need to click on the top node of your filter or structure and select Save As… to make it a global element. Afterwards it will show up in the InfoProvider section. In the project explorer, go to your MultiProvider and choose New à then you can select Restricted or Calculated Key Figure. You will also find the possibility for creating a new Global Structure or a Global Filter here. 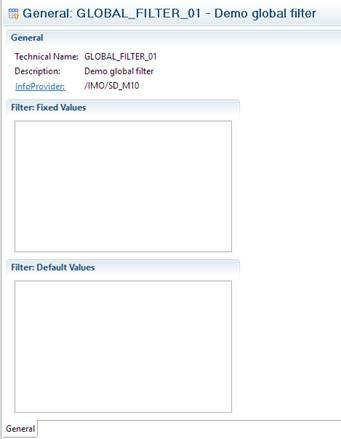 The creation of a Global Filter or a Global Structure is not as smooth as in the BEx Query Designer, because you have to build them starting with the name and then adding your required objects. So if you already have a local filter in your query but you want to save this as a global filter, this is not possible. In this case you have to rebuild your desired filter. 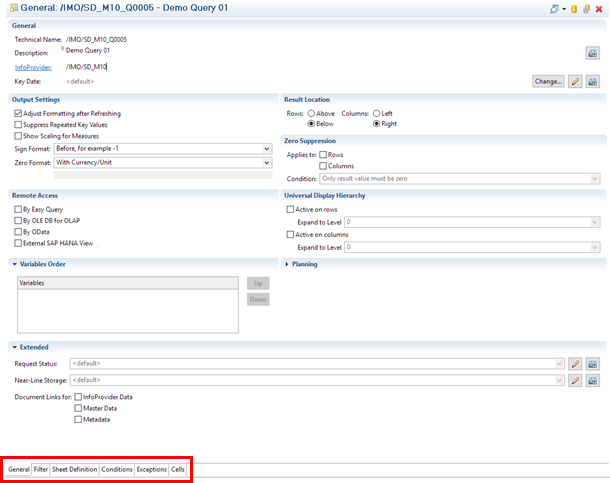 If you have two structures in the BEx Query Designer and would like to use the cell functionality you need to select the cells icon in the query header to get the cells tab. 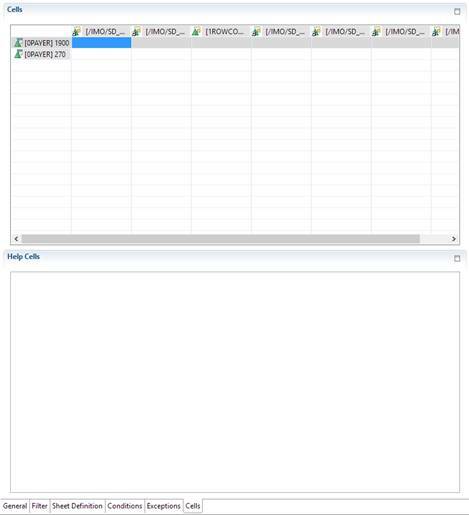 In eclipse the system adds automatically the cells tab as soon as the query contains two structures. Another point is the display of the cells tab. 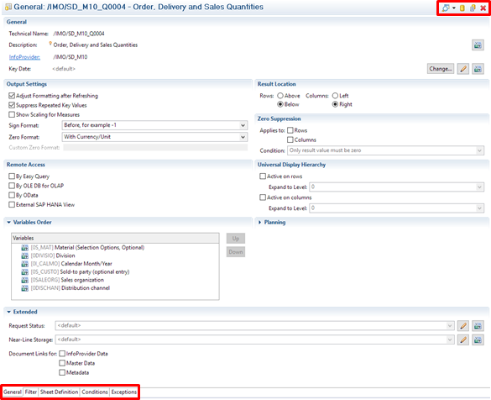 In the BEx Query Designer it is not that flexible as the cells tab in eclipse. 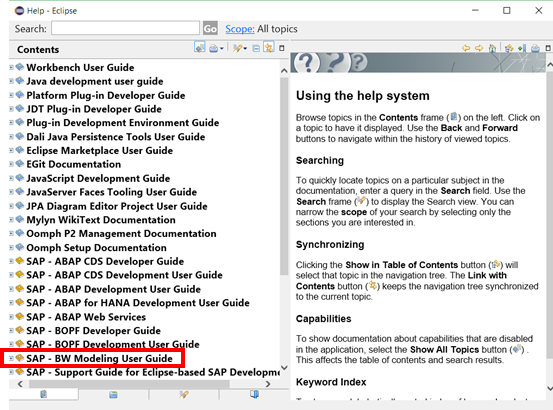 The section for help cells has only a very small part at the bottom of the tab whereas in eclipse you have as default both parts shown in the same size and you may switch between the cells and the help cells part to show only one of them. The preview in BEx Query Designer only shows a frozen example of your query drill down. 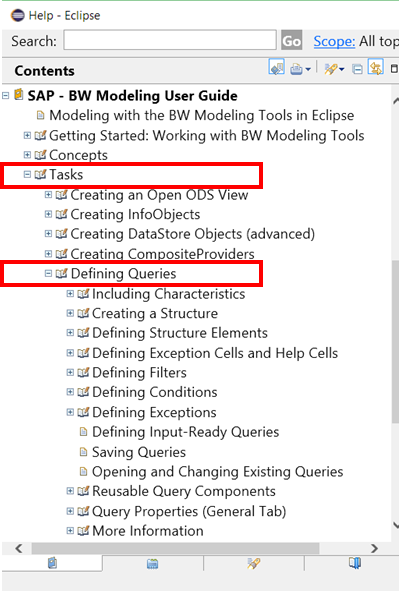 In eclipse BW Modeling you find the data preview button in the top right corner of your query tab and there you have two possibilities for the result preview. The first one is called Analytics List UIBB and offers a real data preview with navigation options on the report you build. In this point the eclipse BW Modeling is much better because you can see the result of your query without much extra effort during your development phase. 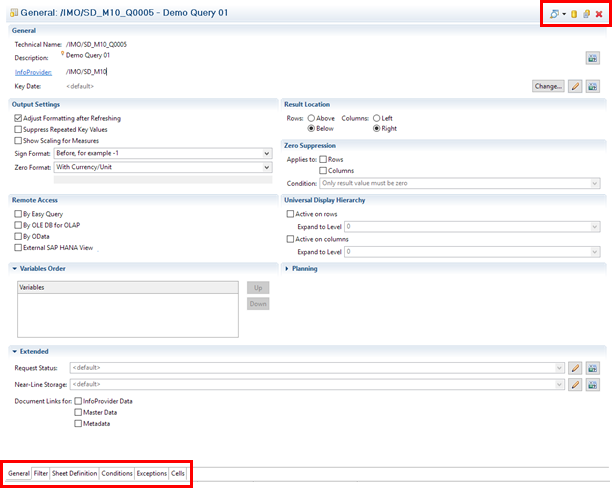 If the result preview is not working initially check if the application server is active (also see SAP Note 2212389) and if the FPM_BICS_OVP service in transaction SICF is enabled. For further questions the eclipse help content might be helpful.